Exploros | Look It Up! In this experience, students learn dictionary skills to help find meaning, pronunciation, and syllabication of familiar and unfamiliar words. Then they work in groups to go on a dictionary scavenger hunt. Finally, they learn that some dictionary entries include synonyms and illustrations. 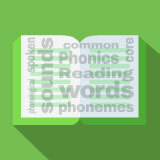 Use a dictionary to determine meaning, syllabication, and pronunciation. When you want a book to read, do you search for fiction? Or maybe you love true tales of great achievements? Sports facts? Well, there’s one book that contains every word in all those books—the dictionary! You don’t read the dictionary the same way you read other books. But many people enjoy spending time with the dictionary to expand their vocabulary and to learn about the English language. The dictionary can send your mind off in every possible direction. In this experience, you will practice using dictionaries. Turn to a partner. Together, use a dictionary to find the meaning of the word navigate. Write a single word or short phrase to define navigate. You and your partner should each write different meanings. Examples include find a way, sail on water, guide, plot, pilot, steer, direct, lead, cross.